Noodles and soup. Simple. A closer look at ramen’s lesser-known cousin. I’ve been eating a lot of tsukemen lately. Too much probably, but I love it. Basically tsukemen is like deconstructed ramen: cold noodles which you dip into steaming hot soup. 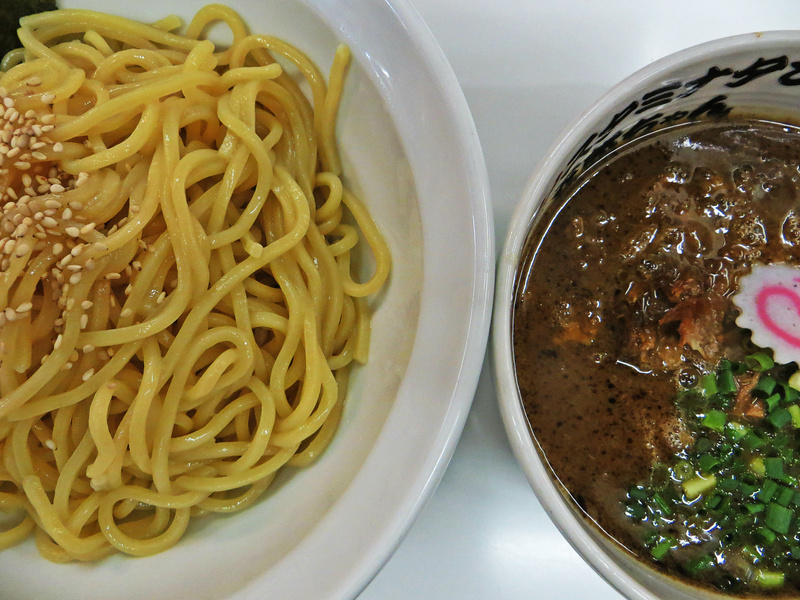 The thing I like about tsukemen is its simplicity – there’s no place to hide as a chef. There are just two main components, noodles and soup, so chefs are faced with the difficult challenge of making it as delicious as possible. The soup itself is quite intense, moreso than ramen. You can’t really drink it on its own, but when it coats the noodles it’s pretty much perfect. At the end of the meal you can top up your bowl with some hot water to dilute it just enough to drink. There are many forms, one of the most popular being a gyoukai tonkotsu soup base which made from a rich blend of pork and fish stock. It’s powerful stuff and can often taste much the same from shop to shop, which is why it’s important for the chef to try and incorporate some sort of twist to make it more memorable. This is usually done through extra ingredients in the soup or toppings. King Kong in Ikebukuro, for example, infuses its vinegar with apple and yuzu, an Asian citrus fruit which is almost like a sour mandarin. Drissle this over the noodles and it makes the bowl come alive. Many shops also grill their chashu (tender pork belly) in such a way to bring out a strong smoky flavour. The noodles should be thick, firm, chewy. They should glisten. Bonus point for tsukemen is that you can order as much noodles as you want for no extra cost. Regular servings are about 200g or 300g but you can get up to 1500g in some places which is ridiculous. I’d like to see someone eat 1.5kg of noodles in one sitting and be able to walk out of the place. 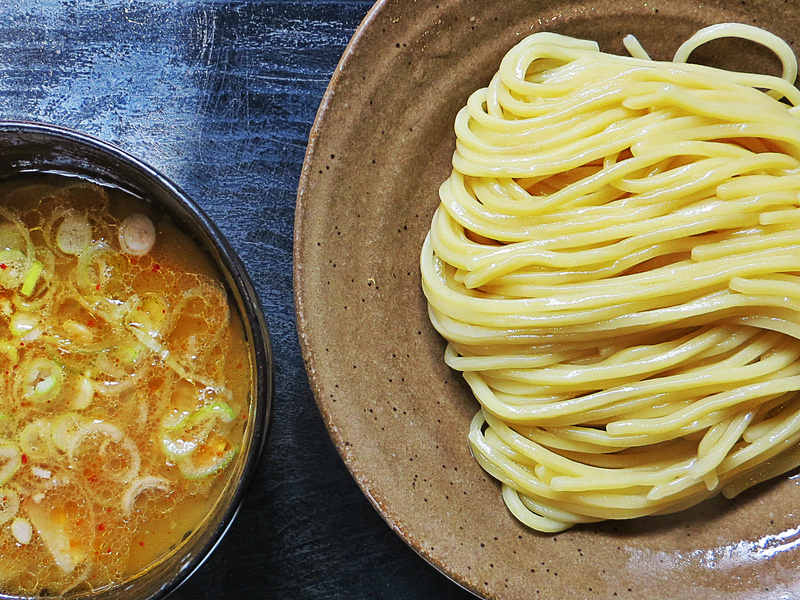 Walk into any ramen shop in Tokyo and you’re likely to find its own variation of tsukemen. But be warned: with 5000 shops in the city, it might take you a while to try them all. There are many ramen nerds online who scour the city looking for the best bowl. If you are interested in ramen or tsukemen, check this out. Also, a guy I know in Tokyo, Eddie, is one of these nerds. He posts up on facebook now and again – you can check his Tsukemen Monster page here. Pingback: Table for one? Ramen in Tokyo | Ikimasho! Pingback: The Grandfather Clock | Ikimasho!